For those of you scoring at home, that's an invisible submarine tank crawler. Because sometimes you want to be underwater, and sometimes you want to crawl along the ground, you always want to be invisible. Except for the bits inside, but come on, who is going to see you in your big scary black robe or, in the case of Wonder Woman, with your breasts barely contained in shiny red, blue, and gold, right? * This motto coming soon to an After School Special near you! Having an invisible vehicle is not really all that useful if you yourself are not invisible. 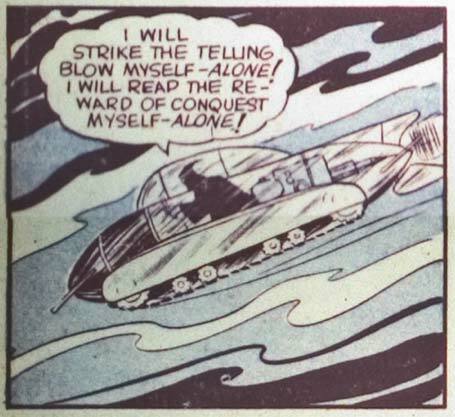 Spider-Mobile, Ninja Tanks, and now an Invisible Submarine Tank Crawler. I’m just curious how many other bad super vehicles are out there. Maybe there could be a future post on what makes a good super vehicle versus a bad one. I always wondered how hey maintained invisible vehicles. How do you check invisible oil with an invisible dipstick? Come to think of it, why is the oil and lubricant and gas invisible, but the people in it are not? And what happens if you do find that invisible dipstick and pull it out, is the oil on it still invisible or does it become visible when you pull it out of the engine? @Dan Gonzalez: LOL! Dan you may find the following video amusing: Click here. I saved this one quite a while ago, but if I recall correctly, I believe the villain in question had just executed his other two followers for letting Captain Marvel go. They’re the couple who didn’t notice Billy Batson getting turned into Captain Marvel in an enormously loud and bright burst of lightning in the cramped submarine compartment they were also in, if you remember that one. The main bad guy was disgusted and killed them, before climbing into his mini-invisible-sub-crawler. So if he’s bitching about being alone, he’s got no one to blame but himself! I swear, being henchman to deranged super villains has got to be the bottom of the barrel, criminal-job-wise. The untold lives of Henchmen could be an amusing comic in and of itself. Holy crap! it’s a FLYING ninja tank! Last week, on ‘Nova'(I didn’t watch the show, but I did read the info), they did a show on Japanese midget subs. I wonder if Squat-So had one of those. Actually, it’s just a swimming ninja tank, Loki. Still holy crap, though.